These are just a few of the questions that customers frequently ask. If you have additional questions or concerns please contact us. Will Wood Flooring easily Scratch?What Types of Granite are available?Do you accept credit cards?How close does the estimate come to the final price? How much deposit do you require before you start to cut our countertop?If I fax my drawing with dimensions to you how long do I have to wait for a quote? What is your payment policy?What is the difference between granite and marble?Is marble suitable for a kitchen countertop? 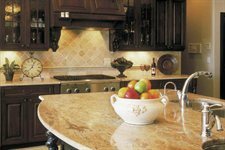 How is Granite formed?How do I clean my granite countertops?Does granite have any pits or fissures? Do granite seams show?Can I use Windex to clean my Granite Countertops?How long does installation take of my granite countertops?What is the most expensive granite for countertops?What is better for resale granite or corian?If I am selling my home what type of granite is best?What type of sink should I use with granite countertops?What kind of edge can be used on granite countertops?What granite colors hide dirt?Can't I just install my own granite countertops?What is granite made of?What is Marble made of?What is Travertine made of?What materials make a good back splash?